There are many words and phrases we use today whose origins are unknown. Phrases are often used with little thought of why we say them or where they come from. Some of those words and phrases originated from the rivers and the riverboats. Following is a list of them, including their meaning and source. Steamboats had tall smokestacks. The boats originally had boilers fired by wood. Along with the smoke there would often be flaming embers coming up from the furnace and out of the top of the smokestack. Those embers could and did start fires when they landed on the top deck or cargo. Tall stacks would give the embers a better chance to burn out before reaching the deck. In addition, the top of the stacks were "fluted". Fluting consisted of wire or steel mesh and acted like a small fence that would break the embers into small pieces. Smaller embers were more likely to burn out faster than larger pieces. As fancier boats were built, the fluting became very ornamental and eventually came to be considered an essential decorative element of the smokestack. Those vessels with the fancy smokestacks and decorative flutes became known as high-falutin' boats. Men will often use this term to describe the admirable attributes of a female, but that isn't its original use. As steamboats evolved from modest packet boats to multi-decked vessels of grandeur design, some had the appearance of giant wedding cakes going down the river. Some were stacked with five to six levels of cabin and lounge decks. These boats were considered well stacked. Another use for the term was in reference to the tall, ornate smokestacks of the fancy boats. Steamboat smokestacks would often have a buildup of soot inside. This buildup could catch fire in time, and needed to be removed. Steam lines were installed to the smokestacks with a valve. To prevent the soot from building up to dangerous levels a valve would be opened, sending a blast of steam into the stacks. This would break the soot loose and send it out the top. Meanwhile the smoke and embers would still be coming up the stack from the furnace. Added to that was the violent hissing and vibration of the steam injection, resulting in a rain of soot falling from the sky. Passengers would often think the boat was blowing up. They would also be unhappy to find the soot landing on their clothes and chairs. Many captains would warn passengers of the event so they could go inside, then deckhands would clean up the mess on the deck. During special events on the outer decks the captain would often be asked not to "blow his stack." This is a very common phrase that is normally used to describe a person who is down and out. It came from a fear of flatboatmen, keelboatmen, and steamboat pilots. If the riverbed was sandy or muddy, there was little fear of splitting the hull, in the event of grounding. A rock-bottomed river was much more dangerous; hitting bottom on rocks was the worst possible conditions to run aground in (to run a-rock might be more descriptive). Gradually, anyone at the lowest possible point in life was referred to as having hit rock bottom. Early river transportation included livestock as cargo. One of the more undesirable animals to transport was hogs. They were stubborn to move, noisy, and would emit a foul odor. 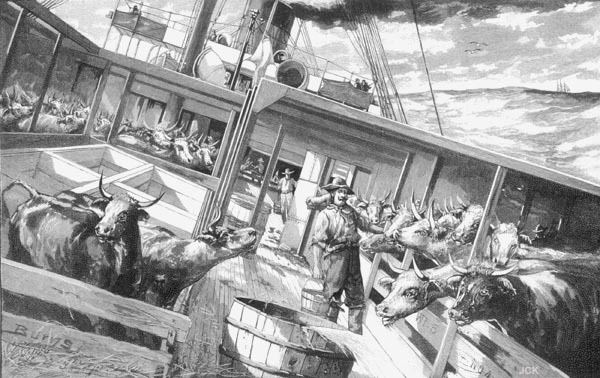 The animals were normally placed on the forward main deck for easier loading and off-loading. This meant that crew and passengers were often located downwind of them. 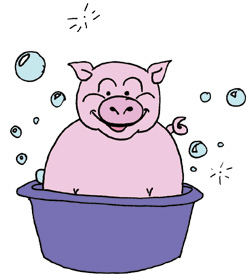 The captain would often order a deck hand to wash the hogs. Afterward, the mess left on the deck had to be washed off. This mess was called hogwash. The job of washing the hogs and deck was not one of the more desirable assignments for the deckhands. In time, any undesirable task given to someone was called hogwash. This term eventually evolved into meaning something that is ridiculous, useless, or a lie. Many boys and men in the early 1800s were named William, Wilbur, or Willie, which may have occurred due to the large influx of German or English settlers in the Ohio River valley. Steamboats landed in towns on the Ohio River, along southern Indiana and Kentucky, and often young men from the hills would be hired as roustabouts to load and unload cargo and passenger bags. Since many of them bore such a common name and came from the hills, the roustabouts became known as hillbillies. The word eventually evolved into representing anyone with a backwoods style. 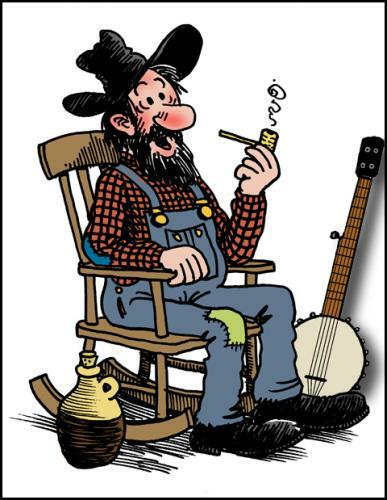 The origins of this phrase have some similarity to the word "hillbilly." In the 1800s all lands west of the Mississippi River was called the outland. As with boats on the Ohio River, steamboats hired local residents to serve as roustabouts. The men coming from the states of Arkansas and Missouri had a reputation for being hard to manage. These rough and tough fellows from the outland were rowdy and fights would often ensue. Over a period of time, anyone misbehaving was considered to be having outlandish behavior. This term is pretty easy to understand, since its present-day meaning is similar to the original use. Steamboats built up a head of steam when power was necessary, which was then let off when it wasn't needed to prevent dangerous build-up of pressure and subsequent explosions. Letting off steam relieved the pressure. Letting off steam today usually means to speak out to relieve the pressure of holding it in. Musicians would often come to the steamboat landings to play. These were usually fiddle players, who would sit by the landing and play their tunes, hoping for coins to be tossed into their cup or hat. Sometimes they would be allowed to play on the bow of the boat as a welcoming for passengers. Other times the captain might give the fiddle player free passage on the boat in exchange for entertainment for his passengers. If the player was really good, he might even get paid for his services. The deckhands and other members of the crew did not have high regard for this fellow who was not really working; he was just fiddlin' around. In time the term came to identify anyone doing useless activity. The "bitter end" is commonly used in reference to a bad ending of a story or movie. In nautical terms it means something more literal. When paying out an anchor line, one sends out the rode, which is the length of the rope in relation to the water depth. Sometimes people will forget to tie off the end of the line to the kevel on the boat. This results in seeing the end of the line slipping through one's hands and into the water, losing the line and anchor. The end of that line disappearing into the water is called the bitter end. The frayed end of a rope is also called the "bitter end." Truckers often use the term "dead head" when they are making a run with an empty trailer. After unloading cargo they may have to dead head to another location to pick up a load. Dead head was first used in the days of steamboats to account for non-paying passengers. A manifest may list cargo, passengers, crew, and dead heads. Dead heads were non-paying passengers who might be anyone not included in passage revenues. It may be a special guest, or even the captain's wife. While working on the steamboats, I would hesitate to call the captain's wife a dead head. Somehow it just doesn't have a charming sound to it. Dead head also refers to a vertically floating log. Most passenger ships call their cabins "staterooms", as do some hotels which use the term to refer to their nicer accommodations. The word has an interesting history that evolved from Texas becoming a state. In 1845 a new steamboat was being built. In honor of Texas becoming a state in the same year, the builder named the largest deck the Texas deck. At the time, Texas was the largest state. The builders carried the naming of the deck a step further. They named the cabins on the Texas deck after each state, and called those cabins staterooms. The tradition continued to modern times, and the steamboats operating today have a Texas deck and staterooms. This is a word that is commonly used in describing horses or a horse-drawn wagon or carriage. Another use of the word was to describe a type of watercraft on the river. Some of the early ferryboats had no engines, but were propelled by sidewheeler paddles and powered by horses. The vessel was steered by a cable attached from each shore and through pulleys on the ferry. A large turntable or conveyer was installed on the deck and attached by gears to the paddlewheels. Horses were made to walk the devices while harnessed to a stationary horizontal pole. This would cause the platform and paddlewheel to turn. The vessels were called hayburners, since that was the only fuel needed for the horses. If a person would tell someone that they had been "bushwacking", it might mean that they were waiting in hiding to ambush an unsuspecting victim. Farmers often use the word to indicate clearing a field before tilling. Bushwacking originated in the keelboat days when the boatmen would pole the boats upriver. They would often skirt along the shoreline if currents were strong or the poles would not reach the river bottom. They would pull on the bushes, trees, and shrubs along the way to help move the boat. They called this bushwacking. A related term still used by boats running very close to the bank is "Runnin' the willers", meaning getting very close to the willow trees along the shore. This phrase also developed from the keelboating days. The boatmen handled long poles that would be used to push against the river bottom. They would walk the length of the boat backward on each side, then lift their poles and quickly go to the bow to push another stroke. This provided continuous power until one of the boatmen would get his pole stuck in the mud. When this happened, it would hold up progress and he was called a "stick-in-the-mud." Anyone who has spent any time in the South, or watched movies about the antebellum South, probably heard this phrase. It is a romantic term used to indicate an attraction for another. The roots of the phrase are from along the riverbank landings of the lower Mississippi River. When cotton was king, huge amounts of cotton bales were loaded onto the steamboats for delivery to distant places. The workers loading and unloading the bales would become covered with the cotton that stuck to their clothes and hair. Since it tended to stick so well, the phrase came to mean that someone would like to stick with another. When we get "decked out" it usually means that we are dressing up. The phrase was actually more literal in its original use. Steamboat captains would often need to make changes to the deck to accommodate unique cargo or special events. This may be as minor as moving some deck chairs around, to building a structure on the deck. The reason for the changes could range from accommodating a cargo of hogs to setting up for a musician. Any time the deck space was altered, it was being decked out. If we hear someone say they have been "sold down the river", we expect that they have been cheated or deceived. It may also mean that a person has unfairly lost something, or possibly has been told on for something they did. The original use for the phrase developed along the Missouri border of the Mississippi River. Missouri was a slave state and known for better treatment of their slaves than the southern states. If a Missouri slave became lazy or unruly, the owner would hold a threat over his or her head. "If you don't do better you will be sold down the river." This would mean that the owner would sell the slave to a landowner in the deep South. The slaves knew about the harsh conditions they would face down the river and may be inspired to improve. The phrase, "Being sent up the river" is related, but applied to someone being sent to prison, since many prisons are built along the rivers. This phrase developed on the Hudson River, about those being sent up the river to Sing Sing prison. When people use this phrase they are usually not referring to navigation, but intend to complete a mission or goal regardless of the challenges. This is a phrase that began in the early days of steamboating and still applies today. Low water periods made navigation very difficult. Running aground and striking shoals were much more likely during low water. High water was almost always preferred for running steamboats, at least until low bridges were built. For a captain to state that he intended to make a run "Come hell or high water" was to intend to go, regardless of the river stage. Hell, of course is low water. We usually think of this as an alcoholic drink concoction that may relieve the symptoms of a cold. It was originally a drink favored by the keelboatmen to warm the insides and provide nutrition. A baked apple was place in a mug of heated rum. It is said that the keelboats used no fuel since they had no engines, but in reality there were huge amounts of rum and apples that fueled the keelboatmen. This word is normally used to describe a blond child. It is a river name for a small island or spit of land extending above or below the main or large island. It may or may not be recently formed. The generally accepted difference between a towhead and an island is that an island is a natural formation and a towhead is formed as a result of an unnatural occurrence. Towheads can be formed from dredge spoils, sunken vessels, and other things that will cause a pile up of sand and silt in the riverbed. We all have hit snags in a projects, meaning something has caused a delay. Women also get snags in their hosiery but the real meaning has to do with a hazard on the rivers. A snag is a sunken tree with one end protruding above the waterline. Hitting one with a small boat, or even a large wooden hull boat can lead to serious consequences. Most rivers have a source at the beginning and a mouth at the end. This is where the river flows into another river, lake or sea. There is a constant flow running off, that goes on an on. Some people tend to do the same thing in their conversations. There never-ending rhetoric can be called "running off at the mouth". One of many superstitions on the rivers was that a person should always step on or off a boat with their right foot, for good luck. Consequently stepping off or on with the left foot was bad luck.